A live TV game against the top team in the competition, broadcast to over two million viewers – you would think last Friday’s FA Cup clash against Wigan Athletic would have been one to relish … well not for Coasters captain Sam Finley! While the 3,400 supporters packed into Mill Farm revelled in a carnival atmosphere, Finley admits he didn’t have a second to enjoy the occasion. 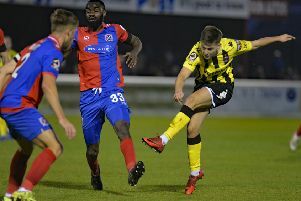 Danny Rowe’s second-half spot-kick earned Fylde a replay against their illustrious opponents and set up a possible third round tie away to Premier League side AFC Bournemouth. Finley (right), who won the all-important penalty against the Latics, insists now is the time for him to appreciate what his side have achieved. “I didn’t have chance to enjoy it one bit at the time!” said the midfielder. “If you switch off for a second to try to take it all in, then you get punished. “We worked hard for 90 minutes so that we could enjoy it afterwards. Now is the time to enjoy what we have achieved and look forward to the replay. “I thought we put in a great shift and dug in deep. “We showed them a little too much respect in the first half but at the end of the day they will more than likely be a Championship side next season. “They have some very good players and I think they will win League One. And Finley believes the Coasters did precisely that. “We were unfortunate to concede as late as we did but for 10 minutes after the break we were brillian,” he added. “We were organised, won second balls and we had them penned in. I knew a goal was coming and once we got it, it was inevitably going to be backs to the wall. They came at us but we were solid. “Let’s have it right – we were up against better players and sometimes you have to just roll up your sleeves. The DW Stadium replay has been confirmed for next Tuesday, with a 7.45pm kick-off.